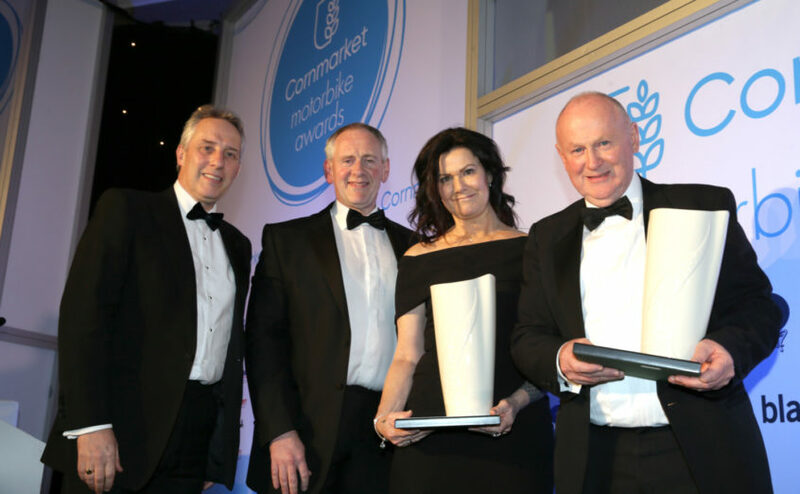 The International North West 200 enjoyed double success at the 2019 Cornmarket Motorbike awards. The race communications team of Valerie and John Crichton, who have manned the race radios for over 40 years, were awarded the Services to Sport award at the glittering ceremony in Belfast last week. 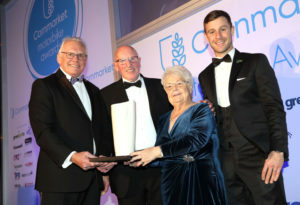 PACEMAKER, BELFAST, 18/1/2019: Valerie and John Crichton receive the NI Air Ambulance Services to Motorcycling award from Ian Crowe and Jonathan Rea at the Cornmarket Motorbike awards in Belfast on Friday night. The N.I. Air Ambulance sponsored award was presented to Valerie and John by Ian Crowe and Jonathan Rea. As a huge fan of the four-time World Superbike champion, Valerie was particularly thrilled to receive a congratulatory kiss from her hero! Event Director Mervyn Whyte MBE also visited the stage to collect the McLean Race of the Year award for the second year in succession. The NW200 had two races in the final shortlist of six- the CP Hire Superstock race and the J.M. Paterson Supertwin event. It was James Cowton’s thrilling last lap victory in the Twins event that claimed the chequered flag. ‘This is a tribute to all the riders who produce such exciting wheel to wheel racing at the North West each season.’ Mervyn Whyte MBE said. Whyte was delighted to see Valerie and John Crichton’s devotion to the North West 200 being recognised in such a special way at the prestigious awards. ‘Valerie and John play a vital role in maintaining the communications systems of the race along with their daughter, Rhonda.’ Mervyn said.